Amazon recommends “people who bought X also bought Y;” Netflix understands what “people like you” enjoy watching; and Waze shows you what drivers ahead have encountered. Your data powers the Artificial Intelligence (AI) algorithms in apps, making life more rewarding, safer and efficient. The helpful insights lure you to come back, purchase a product and share the experience with friends — all of which increases your lifetime value as a customer. Today, entire generations are comfortable sharing private data with digital assistants, shopping apps and dozens of other tools as “payment” for the convenience of data-centric apps. The B2B world has been slow to take full advantage of data as an asset. In a study of fast-growth organizations, McKinsey & Company linked above-market growth with the extensive use of analytics to make better decisions, prioritize workloads, improve forecasting and hone sales strategy. This only scratches the surface! Businesses with more advanced analytics and data are better prepared to deliver greater value to customers. Fast-growth companies aren’t just data-centric, they are data drivers whose leaders think and act differently when it comes to data. AI Or Just BI In Disguise? Attracted by the AI hype, there was a gold rush to acquire better analytics, but companies painfully learned that the value of AI is heavily (if not entirely) dependent upon the breadth, depth and quality of data. The simple fact is AI without a rich source of both internal and external cross-company data is simply business intelligence (BI). With limited data available to fuel AI algorithms, most systems are really just BI, providing a singular, myopic view — at best — of a business’s own customers; it’s very much like Waze with the data of a single driver. To deliver on the B2B equivalent of Amazon recommendations, fast-growth companies are tapping into sustainable sources of buyer behavior data by merging their internal data stores with third-party sources. Do you protect your data like crown jewels or are you using it as a natural resource? Fast- growth companies using AI to fuel sales have figured out an important lesson: the competitive advantage of sharing abstracted data for better buyer insights far outweighs the competitive advantage of hoarding it. By combining internal data with external sources of B2B buyer behavior data, we can unlock endless actionable insights. Analyzing behavioral data as buyers consume complementary and competitive solutions helps marketers focus campaigns to improve results. These insights also allow sales professionals to prioritize prospecting activity and tailor their message and approach to capture similar buyers’ attention and budget. Most companies are paralyzed by the fear of losing control of their data and as a result, they are missing critical insights and are relying on BI to analyze historical internal data only. With siloed data trapped in CRM systems, most companies have yet to realize a 360-degree customer view. Recent steps by Microsoft, Salesforce and others to integrate internal data stores are a marked improvement over the siloed data status quo — but not nearly enough. It’s time to leapfrog the 360-degree view to a multi-faceted understanding informed by combining internal data with cross-company buyer behavior to uncover demand indicators, buying signals and other contextual insights. The way we think about personal data has changed the world. For the same to occur in B2B, we must rethink data — how it’s collected, shared, analyzed and leveraged. We must tap into collective data insights to tailor our approach to buyer preferences, target our messages better and provide real value to the buyer, versus annoying them with uninformed interruptions. And, that means making decisions based on the superset of possibilities, not a myopic view of internal data. Only when we stop hoarding data, can we use multi-dimensional insights to create experiences that cement customer relationships. Chris Harrington is the Chief Operating Officer of InsideSales.com and has driven unprecedented growth at three of the world’s fastest digital sales and marketing powerhouses — Omniture, Adobe and Domo. At one of the first SaaS digital marketing powerhouses, Omniture, Harrington had full responsibility for delivering seven years of annual recurring revenue (ARR) growth. He took the company from $4 million a year to over $500 million before it was acquired for $1.8 billion by Adobe Systems, where he led all enterprise sales. 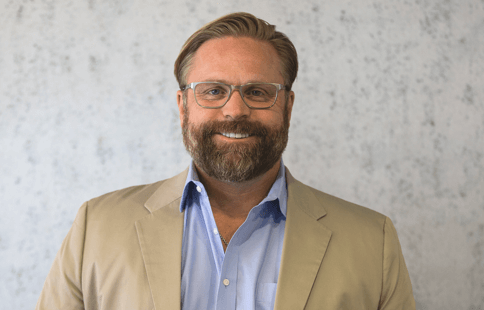 Most recently, Harrington served as President of the $2 billion business intelligence leader, Domo, and continues to serve as a member of the board of directors for Spredfast.